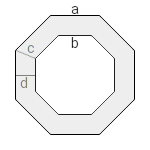 Calculations at a regular polygon ring, a polygon with a hole. This is a regular n-gon, of which a smaller, similar n-gon was removed from its center. Enter the edge lengths and the number of vertices of one n-gon and choose the number of decimal places. Then click Calculate. Edge lengths, thicknesses and perimeter have the same unit (e.g. meter), the area has this unit squared (e.g. square meter).